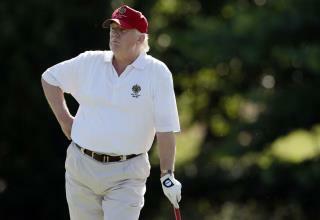 (Newser) – Global warming is just "expensive bulls---t," according to Donald Trump, a position he's often taken publicly, but it looks like he's more than willing to wade in when it comes to one of his own resorts. The last Republican standing has applied for a permit to build a sea wall to protect Trump International Golf Links & Hotel Ireland, his coastal resort in County Clare, and Politico has read it over. The main reason for the wall: an "explicit" reference to global warming via rising sea levels that have led to more erosion and could endanger Trump's property. "It's diabolical," ex-South Carolina Rep. Bob Inglis says. "You have a soft place in your heart for people who are honestly ignorant, but people who are deceitful, that's a different thing." Politico notes that Trump acquired the property in 2014 after an unusually harsh winter, and that just days before he closed the deal, another storm hit and tore away 26 feet of land along the water. He's no idiot...he's a businessman who knows that anything you do in the name of combating the fake global warming scam get's you major discounts. He knows it's BS and he also knows how to play the game! "It doesn't exist until it happens to me". Oh Trump, you clown you.